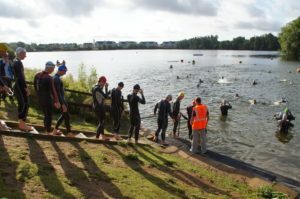 I needed a sprint triathlon as a warm up for the London Triathlon next month. I have raced at Leybourne Lake the last couple of years as it’s very close to where I grew up. Team Outrageous, the club that ran those events seem to have done a bunk and so another club called Ocean Lake Triathlon have stepped in and seem to run all the events at the lake now. Ocean Lake Triathlon made a significant change to the regular bike course by incorporating some quieter back roads running parallel to A228 which made things a lot more fun as there were no big lorries to contend with. Other than that the course is the same as it was before. I was quite a bit slower than in 2011 but I was much fitter then. I still like these races and I think it will become a regular thing to do every year as these races are very well run and low cost.